Fill a large pasta pot with cold water and bring to a boil. Meanwhile, heat olive oil in a heavy large skillet on medium. Add tuna immediately and break up with wooden spoon. Heat through a few minutes then add tomatoes and salsa. Bring to a simmer and add capers and raisins. Stir and cover. Lower heat to medium low stirring occasionally. Cook pasta according to package directions. Drain and put into bowl. Add olive oil and stir gently. Add a little sauce to bowl then divide into bowls. Shave Parmesan cheese onto top. 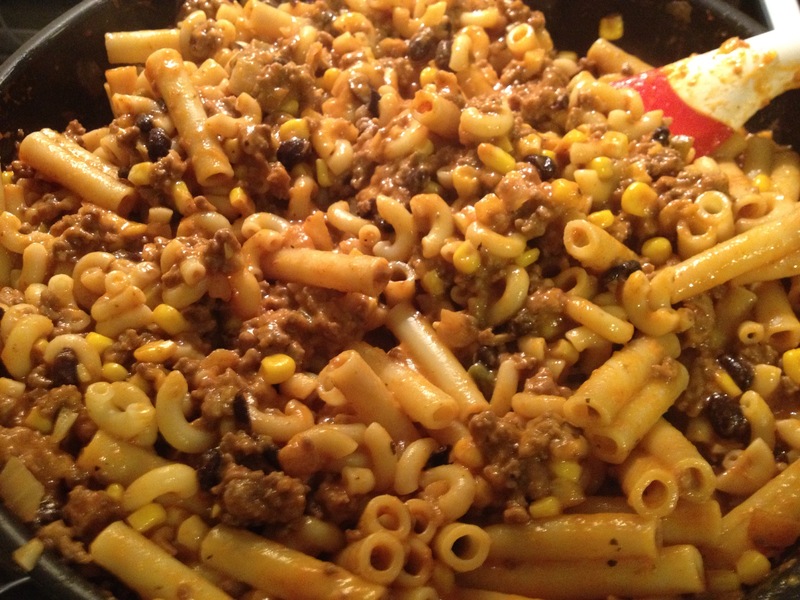 Ground Beef Skillet: It’s Chili / Mac & Cheese! This post originally appeared May 3, 2012. Since then it has gotten more hits than any other cooking post I have put up. 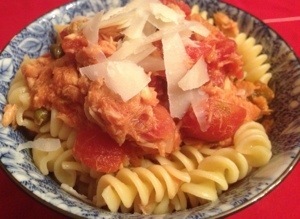 The beauty of this recipe/non-recipe is that when you make it you realize you can change it any way you like. Cook with me and you will learn how to rely less on the written recipe and more on your taste and the taste of the folks who share your food. Please let me know if you make this and how it came out. Feel free to post pictures on my Facebook page. Unnamed but good. Silly name, but that’s what it’s called in our house. The original recipe was on a box of Kraft Macaroni and Cheese. By the way, its macaroni and cheese not pasta and cheese, right? So why do we call it pasta? I dunno! I cannot find the original recipe cut from the box but if I recall, you brown ground beef, add onion and canned tomatoes. Meanwhile you cook the macaroni. 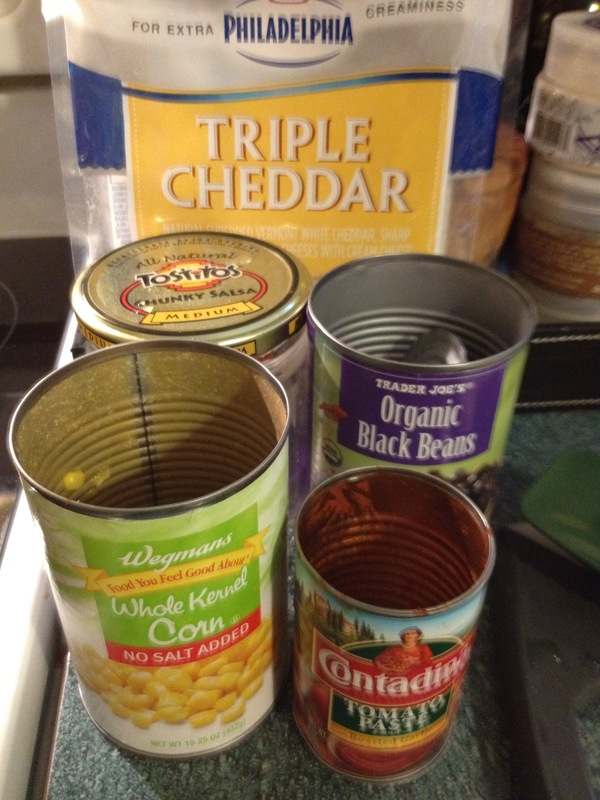 Add the cheese packet and cooked macaroni, canned corn and voila, dinner! My husband “named” it and the “unnamed” stuck. Well, I haven’t purchased macaroni and cheese boxes since my son was in 9th grade and decided to dedicate himself to swimming and fitness. It paid off for him but denied me some good quick junk food. Ah…the perils of parenthood! I avoid as much food with ingredients not in their natural state as possible (dried cheese powder?) so I decided to make my own version of this ground beef skillet. Sauté a chopped onion with a little olive oil in a large skillet and add a few cloves of garlic (I use more than a few but that’s just me) coarsely chopped and stir. Add 1-2 pounds of ground anything. I like beef but you can use any ground meat. If you do not want to use meat, sauté mixed mushrooms and add more beans. Yum! While this is browning, put a large pot of water on to boil. Cook 8 ounces of any kind of macaroni being sure to add the longest cooking first. I like to use leftover macaroni and really like the look of the different sizes in the pot. Once the meat is cooked through add a jar of salsa (we like medium heat), a can of corn, a can of beans (any kind you like) and a small can of tomato paste. Cook through until it has a smooth almost creamy texture. 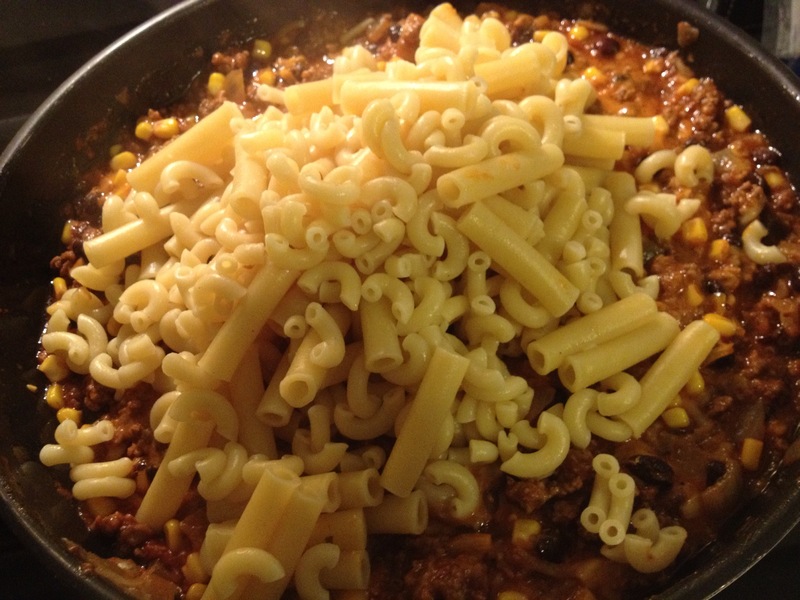 If it is too thick ladle a scoop of the water from the macaroni to get the consistency you like. Add a bag of cheese to the mixture. I like the cheddar three cheese blend with cream cheese. Drain macaroni and stir into the meat mixture. Enjoy! 1-2 Lbs Ground Anything (Beef, Turkey, Lamb etc) or a mixed variety of mushrooms.